For the final week’s project using ml5.js, I put together a LSTM text generator with a poetry model and text-to-speech generator. I used Web Scraper in Chrome in order to get the text information I needed to train the machine learning process. I needed to create a text file containing the information I wanted the algorithm to learn from, but I didn’t want to go through the laborious process of manually collecting it from individual web pages or Google searches. 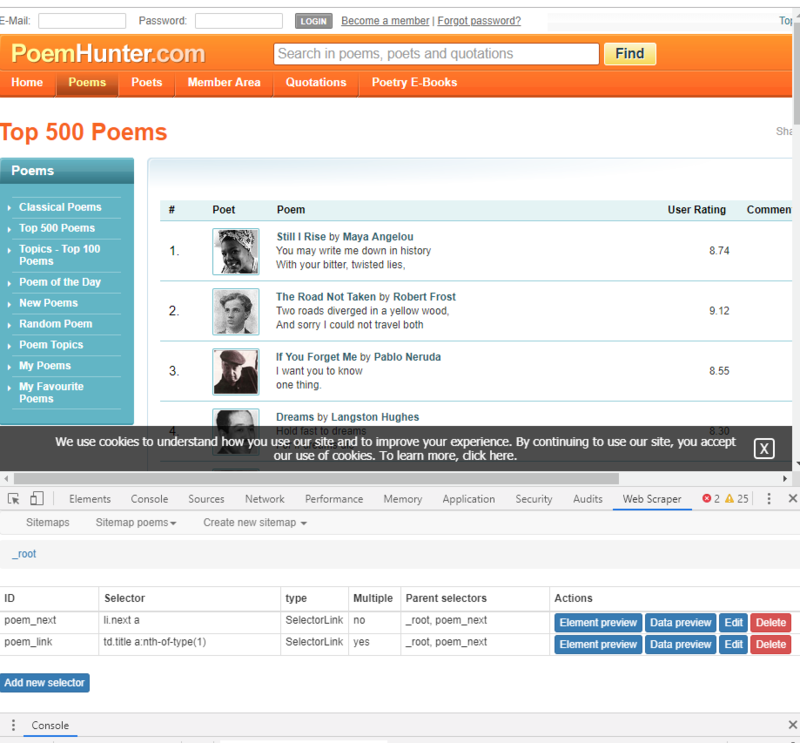 Using a web scraper makes the task automated by the computer. The only information that is required is a ‘sitemap’ that you can put together using Web Scraper’s interface: pick out the html elements that designate which text, links and data of interest are located to describe to the scraper how to navigate the page and what to collect. After the process is complete (or if you decide to interrupt it), you can export a .csv containing the data collected by the Web Scraper process and copy the column(s) containing the desired data into a .txt file for the training process to use. In order to prepare my computer for training, I had to install a few packages to my Windows 10 Powershell, namely Chocolatey, Python3, and a few python packages (pip, Tensorflow, virtual environment). It’s worth noting that in order to install these I needed to enable Remote Scripts: by default, Windows 10 prevents you from running scripts inside Powershell for safety purposes. with 15 minutes of scraped data (3500 iterations, poem paragraphs), it took about 15 minutes to process. For a second batch, I collected about 30 minutes of data from a fanfiction website (227650 iterations, sentence and paragraph sizes) and I believe it took a little over 3 hours. I adjusted the hyperparameters as recommended on the ml5 training instructions for 8mb of data on another 15 minute data set containing an entire novel (55000 iterations, 360 chapters) and instead chose to run the process on my laptop instead of my desktop computer. The average time/batch was ~7.5, larger than my desktop’s average of ~0.25 with default settings. This was also going to take approximately five days to complete, so I aborted the process. I tried again using default settings on my laptop: the iterations increased from 55000 to 178200 but the batch time was a respectable 0.115 on average. The training file on completion creates a model folder, which can be substituted for any other LSTM model. One of the contributed libraries for p5.js is the p5.speech library. The library is easily integrated into existing p5.js projects and has comprehensive documentation on their website. For my LSTM generator, I created a voice object and a few extra sliders to control the voice’s pitch and playback speed as well as a playback button that read the output text. Now I can listen to beautiful machine-rendered poetry! The sky was blue and horry The light a bold with a more in the garden, Who heard on the moon and song the down the rasson’t good the mind her beast be oft to smell on the doss of the must the place But the see though cold to the pain With sleep the got of the brown be brain. I was the men in the like the turned and so was the chinder from the soul the Beated and seen, Some in the dome they love me fall, to year that the more the mountent to smocties, A pet the seam me and dream of the sease ends of the bry sings. 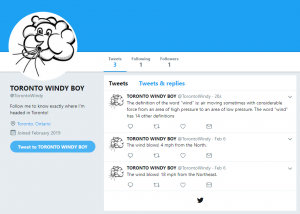 This week we were tasked with utilizing an API in order to ‘do something’. 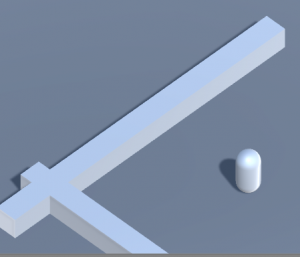 So I built a very simple weather app in Unity. It took a little scrounging around to find practical examples of what I wanted to accomplish. I came across AtlasVR, a beautiful example created by Sebastian Scholl and Nate Daubert as well as a script written out of boredom by a Unity forum user known as ‘johnnydj’. Both seemed to have been written for slightly older versions of Unity based on their usage of the depreciated ‘WWW’ class, so with reference to the Unity Documenation I modified the scripts to use the modern ‘UnityWebRequest’ class. I used OpenWeatherMap.org as the provider of the JSON-formatted weather data used in my Unity project as denoted by the two sources: after registering on their website, anyone can make a request to their system at a rate of 60 calls per hour.. not significant but enough to get my application working. With testing, I was successfully able to parse the retrieved JSON information and use the data in Unity! Being able to access these numbers and import other elements of OpenWeatherMap’s variety of JSON properties with the script opened the opportunity to use them within Unity’s game environment. I was able to adjust the color value of the directional light with the temperature values and increase the density of a particle fog using the humidity percentage. The capacity to use this information to model real-world environments seems powerful, and I’m glad that I now have access to this script for future reference when developing JSON-based API accessors / decoders. 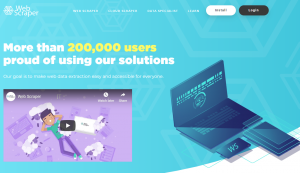 From my understanding, this method of storing information can also be used for saving games or sharing information across networks in easily readable format. Perhaps it’s not as efficient as binary, but it’s incredibly legible. We were introduced to the XBEE radio transceivers. My radio kit came with a Lilypad Arduino which conveniently could be used to configure the radios. I tested the device out with another student and we sent several strings back and forth between eachother. Reminds me of the command terminal on computers / past arduino serial communication experiments. The XBEEs were relatively easy to setup with the aid of the lecture slides provided by our professors and the necessary firmare. Transmissions have been clean so far, but will have to watch out for dropped packets when testing in the future. Since the XBEEs don’t natively fit on breadboards, I soldered the breakout board provided to us after class. – serial can be used to communicate with the XBEE for testing purposes, but ‘Serial1’ must be used in the Arduino code to denote communication with the 1 and 2 pins. For the sake of our task to create a device to interact with a metronome signal I was inspired to use several servos I had leftover from last semester to create some sort of rabbit. I wanted the project to be relatively simple but demonstrate motion and have an entertaining appearance. I first tested out the servos with both a 9V power supply and a USB power supply. Supplying the four small devices that would be the legs worked as expected and operated fine with some demo code provided through Arduino’s IDE (Servo Sweep and Physical Pixel), although I discovered yesterday that the charge remaining in my battery supply seemed to have diminished overnight and lost its efficiency. 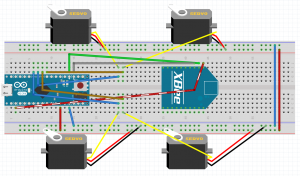 The weight of the device on the breadboard began to concern me as I thought about how the device would be supported if it were to be an enclosed object. 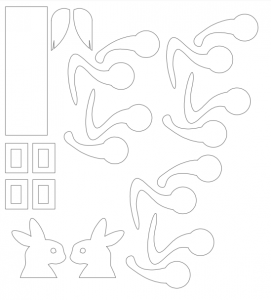 When it came time to design lasercut parts for the device, I created two types of legs to test (forelegs and back legs), with multiple copies cut to allow them to be laminated for thickness. 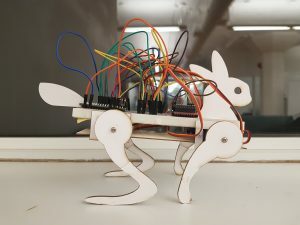 The servos were mounted beneath the device’s breadboard with Weldbond and a second panel and oriented as appropriate for the four-legged mammal. 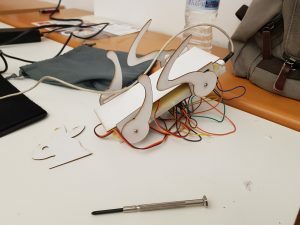 The legs were mounted to the servos with the kit attachments, some glue and screws; without the screws, the legs were unable to support the weight of the device. The code has been designed to operate in two different states: a wide stance for a “High” signal and a narrow stance for a “Low” signal, in similar appearance to the visual look of a sprinting rabbit. 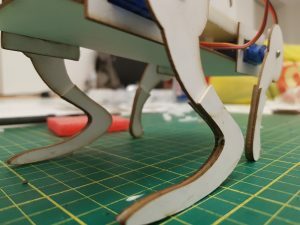 The orientation of the servos required, for example, that the left back leg was positioned to a different angle than that of the right back leg in order to appear symmetrical. For my code, this meant that the angles for the respective servos were at opposite ends of a range between 0 and 180. Naturally, having the legs span the whole range of the servos looked peculiar and caused some technical hiccups with the leg behavior, so it was reduced to an appropriate span. The back legs seem to perform more effectively than the forelegs, which often get caught in awkward angles causing disruptive behavior. This may also be due to my selection of servos for the forelegs, which are of a different, cheaper make than the hind ones supplied by last year’s Creation and Computation class kits. Along with several other classmates I tested out my device’s functionality with the radio signals of other XBEEs. It took a bit of troubleshooting to detect but it turns out the device works fine, if a bit finicky sometimes with receiving the data packets. This could be due to the amperage draw of the servos competing with the XBEE; given some of my past experiences with servos I’m fairly surprised how well the circuit has been working up to this point. I did end up getting a replacement battery, which worked just once with the remote signal but afterwards lacked the capacity to support the circuit. Perhaps I will look into using 12V instead of 9V in the future.